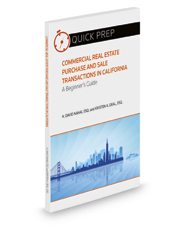 Commercial Real Estate Purchase and Sale Transactions in California is a brief, user-friendly introduction to the world of purchase and sale deals under California law and practice. It is a must-read not only for anyone seeking to enter the real estate arena (whether as a lawyer, broker, advisor, professional, seller, buyer, student, or otherwise), but also for anyone already connected to the real estate ecosystem who may benefit from a fresh, up-to-date treatment of the subject, written in a direct, engaging, and informal style. The authors bring a combined 50 years of transactional expertise and have managed to distill that experience into a work that is relevant and real, with practical advice and actual life lessons. The book adopts the unique approach of taking the reader on a journey, tracing the various steps of a transaction from beginning to end. Thus, the reader derives a true sense of what it is like to live through a purchase and sale deal. What are the problems that can arise, what negotiation strategies are likely to succeed, and what are the pitfalls to be avoided? This book provides useful, real-world answers.